Habitat: An upland tree found in the northern hardwood forests. Characteristics: Trees reach a height of 70-80 feet and may have a diameter of 3-7 feet. 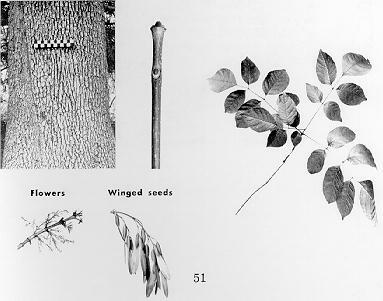 The leaves of this ash and other ash species are opposite, feather compound. The leaflets occur in groups of 5-9. Almost every American boy knows a great deal about white ash wood. He has felt the familiar "tock" and tingling jolt which accompanies the swinging of the ball bat made from white ash. White ash grows over most of the state on moist, deep, well-drained soils in small isolated stands. Other relatives found in Missouri are blue, green and pumpkin ash. Winged seeds are borne in clusters on the twig. These are spread by wind or water or a combination of both. 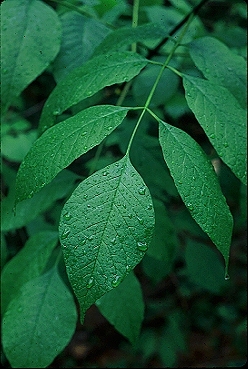 Leaves are opposite and compound with 5 to 7 leaflets which are oval and usually smooth-edged. Smaller branches are stout, round and smooth. At the tip of the twig there are always three buds, the large, brown, pyramidal terminal and two small lateral buds. On older portions of the tree, bark is thick, dark brown, or grey and broken into flat ridges. Because of its toughness, strength, and flexibility, the wood is used in the manufacture of athletic equipment, machinery, tools and furniture. It is a beautiful, light-colored wood with a distincitive grain. White ash seldom exceeds 100 feet in 1/2 feet in diameter. Because it is so hardy and has good form, it has been widely planted as an ornamental tree. It is rarely planted in forest plantations. Ash is a lover of light, therefore it will not grow rapidly under shaded conditions.